today we're teaming up with the folks at the ladders, a comprehensive online career platform that helps make job searching simpler, focused, and more efficient. they reached out to me to share some experiences and lessons learned from my first job, and i thought that would be a great idea. experience makes us wiser. my first job in high school was working at a family-owned 1950s themed ice cream shoppe that served food and had an arcade, a miniature golf course, and a single-screen movie theatre. i fell into the job because my dad knew the owners. my brother and i both worked there after school, on weekends, and throughout the summers for about 5 years. it was a lot of fun and that job was such a wonderful experience for both of us. 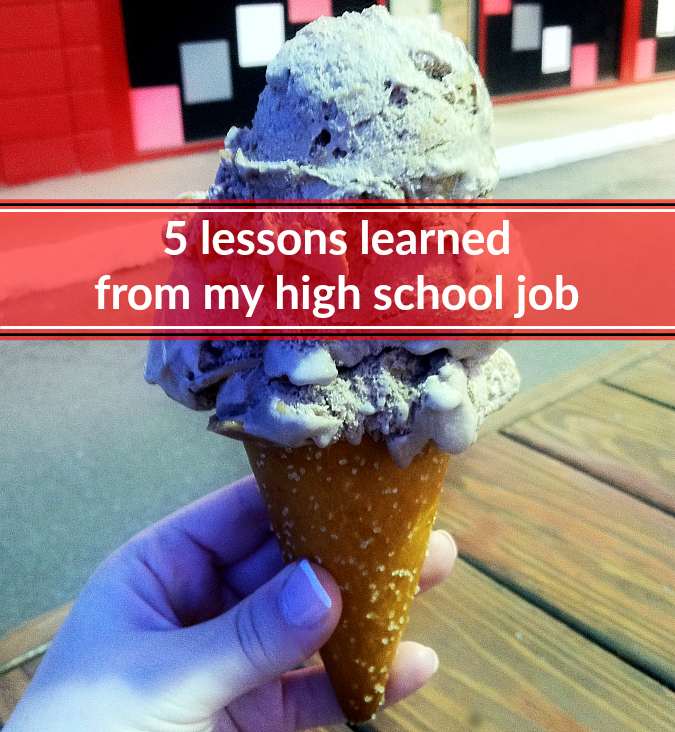 even though it was "just a high school job" i learned important lessons that helped shape my professional life. anyone who has ever worked in food service, retail, or hospitality knows that customers can be difficult. although that old saying "the customer is always right" is not necessarily always true, the customer has to think they're right if you are ever going to get repeat business. have patience and be nice to customers. you need them to keep any business alive and thriving (and you might be relying on them for tips for your good service). i grew up in a household with two parents who both had degrees in accounting. needless to say, i have always been mathematically minded. it must be in my blood. my parents taught me all of the important life skills that you don't learn in school like how to balance a checkbook, etc., but when you earn your own money and get to manage your own money, you really learn the value of a dollar. there's no secret to success. rather, hard work pays off. when i hear the phrase "work ethic" i think of my dad. he has the best work ethic of anyone i have ever known. even though it was just a high school job, my dad always encouraged us to treat it like it was the most important job. if we were scheduled for a shift and didn't feel like going in, we went. if we were having a bad day, we left all of the nonsense that was going on at the door and walked into our shift with an open mind and ready for work. we took ownership over what we were doing (even if it was just scooping ice cream some days) and we always put our hearts into it. we worked hard and were rewarded for our work ethic. a good work ethic will get you far in life. you never know what each day brings. learning to roll with the punches is an important lesson to learn in any business. don't get caught up on the little things, and remember to keep the big picture in mind. life goes on and interests change over time. if you disagree with a co-worker or a boss, or if you need to leave a job for one reason or another, don't burn bridges. leave on good terms. you never know when you will need to ask someone for a letter of recommendation, or if you are interviewing for a new job you want to know that your old employer will give you a good referral. what was your first job? i'd love to hear about it! No matter what type of job it is, you should do the best you can. The experience is invaluable even in the smallest situations. Good advice. These are all excellent points. My first job was at a swimming pool, first in the snack bar and then as cashier, and I worked there over four summers. It was an excellent first job and I applied all of your five points to that job.